Hugh Jackman may be done playing Wolverine, but Logan managed to inspire another movie centered on a mutant with adamantium claws and a bit of an anger problem. It looks like Laura, aka X-23, is getting her own spin-off movie. While Fox hasn't nailed down a release date or a creative team, a script for a Laura spin-off is in development, as confirmed by Logan director James Mangold. Here's what he had to say about it. 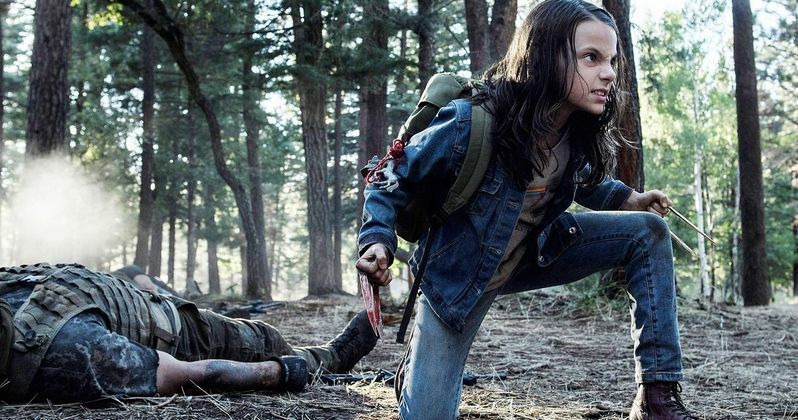 James Mangold didn't have much else to say about it at the moment, but that's enough to let fans know that the Logan spin-off featuring the young Dafne Keen is in the works. Logan has a great many impressive elements to it, but Keen, who made her feature film debut, absolutely stunned as X-23. As such, there's been a little bit of buzz about her getting a spin-off ever since the movie debuted. During the Logan Noir screening a few months ago, Mangold indicated he's very interested in a Laura movie, but at the time, it didn't seem as though Fox was moving forward with it. "Anything's possible. I've certainly talked to them about it. I even talked to them about it before we made the movie. I thought she was just such a great character, but with what Dafne did, I think that certainly that's possible." Logan feels like the perfect conclusion to Hugh Jackman's Wolverine, so doing any sort of sequel to the movie would feel a bit wrong. However, there's a lot of room to explore Laura's character in a spin-off in a way that likely won't feel forced. Producer Hutch Parker also talked a bit about the studio's desire to bring back Dafne Keen for her own movie. "Yes, there are other facets of that character and some others potentially to explore in their own way. It may not be in the same exact tonality or with the same genre orientations as Logan, but I think part of what has been opened up in this universe to all of us now is, drawing on different genre traditions, there are new pathways to be opened for new characters that populate this universe." Hugh Jackman certainly won't appear as Wolverine in this proposed X-23 movie, but will he be involved at all? Sadly, no. Jackman says, "No, I won't be a producer on a Laura sequel. But I will be lining up on the Thursday night at 10 p.m. to watch it though. She is just phenomenal." So hanging up his claws appears to mean that he's really, truly done with the X-Men movies entirely, but he seems quite supportive of the idea. Logan is the rare comic book movie that has legitimate Oscar potential, as well as being a massive box office success. The movie grossed $616.7 million worldwide and 93 percent approval rating on Rotten Tomatoes. If all goes well, the movie could be present at the Academy Awards as well. With all of that taken into account, it's no wonder Fox wants to do an X-23 spin-off movie, as revealed in a recent Hollywood Reporter feature about Logan. At the moment, it isn't clear if James Mangold will direct, assuming the movie moves forward, but he certainly seems to be heavily involved. We'll be sure to keep you up to date as more details on the project are made available.